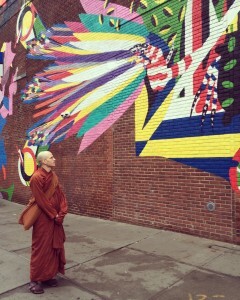 Bhante Suddhāso is a Buddhist monk living in New York City. The co-founder of Buddhist Insights, a new platform using technology to build community and facilitate access to reliable monastic teachings, his work aims to convey Buddhist concepts and their practical applicability to everyday life. Bhante Suddhāso practices meditation according to the original instructions given by the Buddha in the Pāli Canon – the oldest collection of Buddhist scriptures, which contains an enormous amount of very detailed and precise guidelines on how we can live our lives in a way that reduces our dissatisfaction and discontent. Since the Buddha’s teachings can occasionally be difficult to comprehend, he also aids others in developing an understanding of the Pāli Canon by periodically offering talks on meditation practice and on the Suttas, while providing paragraph-by-paragraph explanations of the Buddha’s discourses in the form of annotated Suttas. 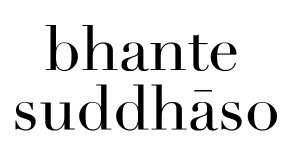 Bhante Suddhāso has studied under the guidance of some of the most important names in Western Buddhism, such as Ajahn Pasanno, Ajahn Amaro, Ajahn Vīradhammo, and Bhante Gunaratana. He was initially trained in Soto Zen Buddhism at Tassajara Zen Mountain Center. Subsequently, he was ordained at Abhayagiri Buddhist Monastery in California, where he was trained in the Thai Forest Tradition of Theravāda Buddhism. Since then he has lived at a variety of monasteries from different Buddhist traditions in both rural and urban environments. A dedicated teacher, Suddhāso has taught to people of all different ages and walks of life, as well as college students of universities like Harvard, New York University, Fordham University, University of Mary Washington, Sarah Lawrence College, and Suffolk County Community College. Bhante Suddhāso brings to the table his first-hand, in-depth experience of both Theravāda and Soto Zen, as well as scholarly knowledge of all other Buddhist traditions.